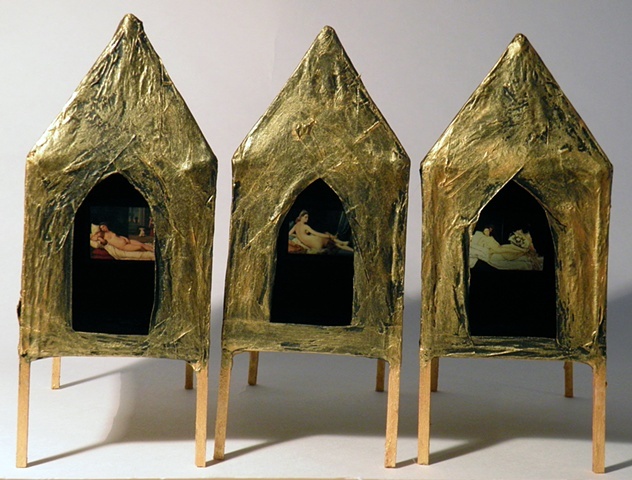 These shrines, constructed from basswood and papier-mâché, each contain one 35mm slide of a masterwork from art history. The hand-size house forms mirror vintage single-slide viewers, inviting an audience of one to peer inside each small dark space for a visual delight. Three nudes, Venus of Urbino by Titian, Grande Odalisque by Ingres, and Olympia by Manet, are framed in tiny paper walls and illuminated by accidental light. The reclining female figures, icons of Western Art’s perpetual male gaze, are reduced to titillating glimpses of the original paintings. The ephemeral qualities of paper and film raise questions about the relative permanence of oil and canvas, and challenge perceptions of “high art.” These objects ask the viewer to consider how seemingly endless, disposable copies of historical masterpieces impact the significance and understanding of the originals.